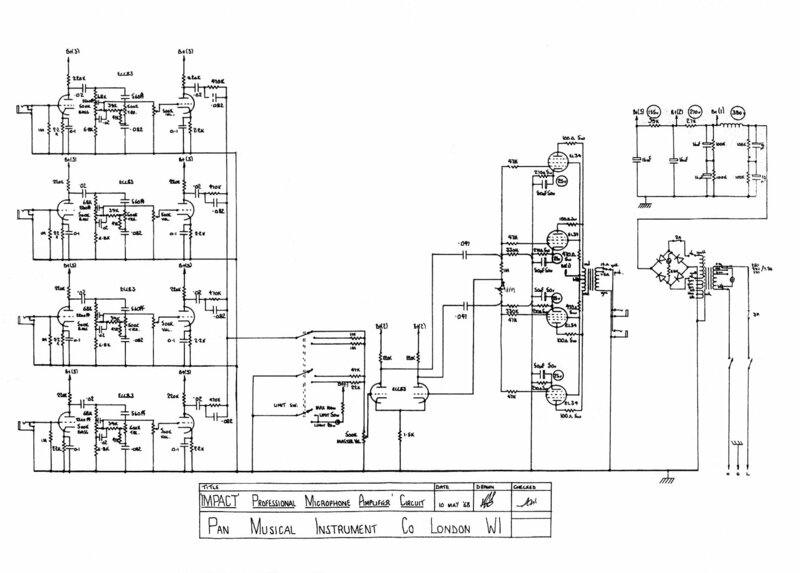 IMPACT Valve Amplifiers and Loudpeakers. My interest for Impact amplifiers all started in the summer of year 2000, when I got an Impact 60W amp head from a friend who had found it on a garbage dump! I had then never heard of the brand, but it looked fairly well built, so I got curious about what it was. The information on the amp told me it was made in England, probably 1969 or 1970, since the date codes on the caps were late -69. I started searching the Internet for information, but with very poor results. 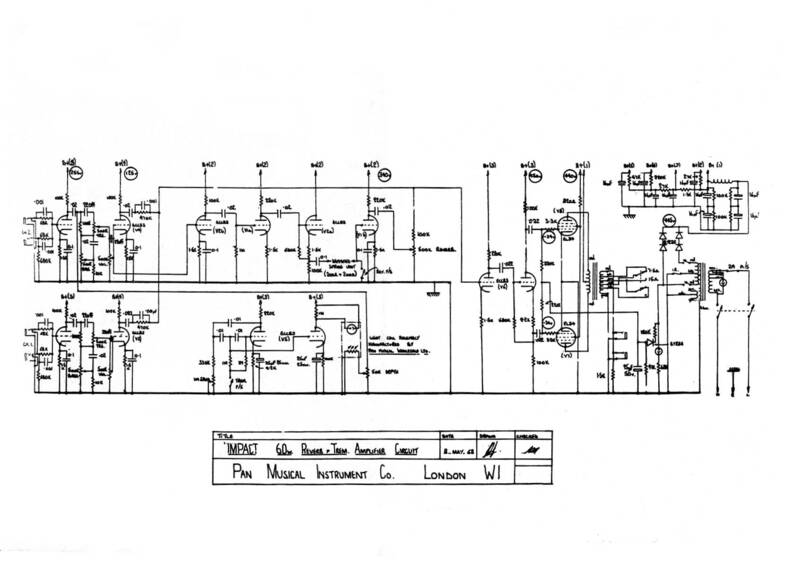 Impact Amplifiers was started in London in 1963 by Don Mackrill and Laurie Naiff. The company was called Pan Musical Instruments Co. and also had some music stores, Pan Music, Take Five and King Street Music Stores. The factory waslocated inWardour Street, above the famous Flamingo Club. The Impact business was later sold to Dallas Arbiter. I still haven't found out when that happened, but it had to be in the beginning of the 70's. Don Mackrill is still in business with his Don Mackrills Music Stop. Thanks to Tim Fletcher I got in touch with Don quite a while ago. Thanks Tim for the tip, and thanks Don for the information! Thanks to Don, I also got in tuch with the Swedish Impact distributor at the time. The company was called AB Sinectro, and was located in Stockholm. Below is their sign on the back of amps sold in Sweden. It's missinng on my own Impact 60, and the Impact 100 never had any, since the 60 was the only model that got S-marked and approved for the Swedish market. How the 100 got here I don't know. Maybe a sample item? S-marked amps has the voltage selector removed, and a few fuses added for higher safety. The Impact 60 head was the most common and popular model. It appears in two versions with minor differences, one with a brighter sound, probably intended for microphones. There's also a version with Reverb and Tremolo included. The transformers were hand made by a company called Ladbroke Transformers in Harrow Road, Willesden, London, although I've got pictures of a 60 Reverb amp with Partridge transformers. The cabinets were made by an unknown company in Essex. The speakers used were mainly Goodman. I have acquired the Impact 100 shown on pictures here. It's a bit strange designed, where the power amp section is almost a blueprint from the Vox 80/100 amp, the forerunner for the AC-100. It has four cathode-biased EL34 power tubes, running very hot, for most tubes abowe their maximum capability. The three pre-amp sections are the same as in the Impact 60. I've had quite a lot of work to make it work properly, but now it does! I still haven't heard of any other units of this model than this one. 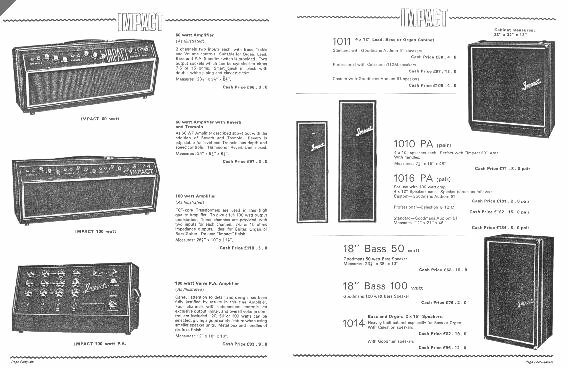 The amps called "Impact by Status" were manufactured after the Dallas Arbiter overtake, and are really Sound City amps in Impact-styled cabinets. There seems to have been one model with the S.C. 50+ and one with a S.C. 120 amp. The 4x12" speaker cab shown here, is probably also manufactured by Sound City/Dallas Arbiter after the overtake. Status was really a string manufacturer within the Dallas Arbiter group. Most reports from Impact owners have come from Finland and Sweden. One 60 Reverb has been reported from England, and one ordinary 60 from the US. I have seen a couple of the 60 amp for sale at eBay-UK. 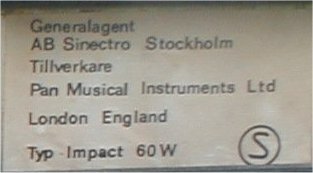 There have also been some reports about a few of Impact by Status amps from Finland, Germany and England, but I don't regard them as being real Impact amps. There have been a couple of both types for sale at eBay-UK too. I've got some nice pictures from a guy in Växjö, Sweden, of an Impact 60 head with an original 2x12" cab, equipped with two different Goodman speakers! I've also got some pictures of another Swedish Impact 60 head, but with two "Tallboy 1008" 4x8" column speakers. There are also some pictures of a 60 Reverb head from Finland. From the Swedish distributor I've got two Impact brochures from different years. I don't know what years though.One is Orange and the other one is Blue. I'm quite certain that the blue one is from a later year, as it has more amplifiers and speakers in it. As some of the models in it is the same as the original shematics from 1968, my guess is that it's from 1969 or later. 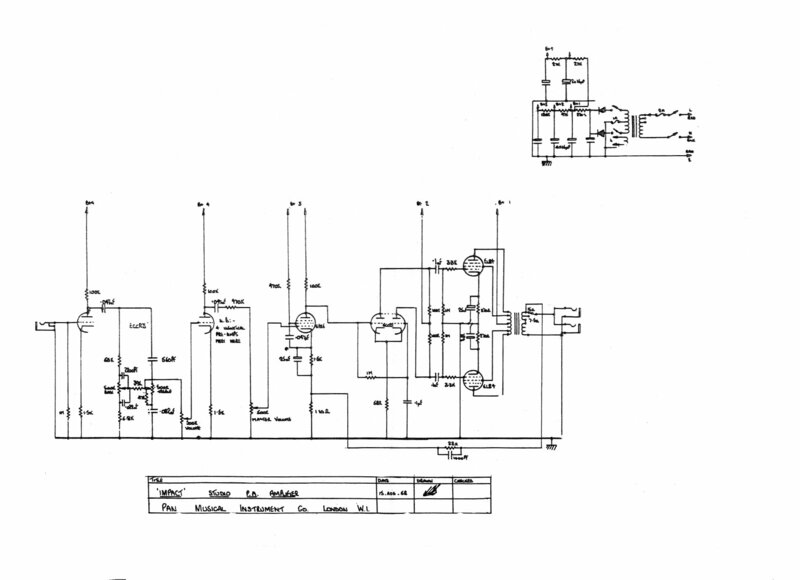 New schematics for the 60 and 100 amps are presented on their dedicated pages. Those are drawn from my own two Impact amps, and with some additional information from others for the "bright" version of the 60 amp. There is now also a few original schematics for some Impact amps. The guy I got the 100-watter from, recently found them in his garage! :) Thanks Hasse! These original shematics, dated 1968, are for the 60 Reverb & Tremolo head, the 100W P.A-amp, the small Studio P.A-amp, and the Studio 4x10" Combo amp with Reverb and Tremolo. These are all described in the Blue brochure, which make me think that it is from 1969 or later, and the Orange brochure from pre -69. The 100W P.A.-amp is almost the same design as the 100W head, but with four channels and some different component values for a brighter sound. Recently I got me another scarce, English guitar amp, a Miles Platting V.100 from 1974. It's totally hand built, all point-to-point wired. It has two Fender-styled preamps with a Marshall-style 100W power amp. If you know anything about that brand, or want to know what I know about it, please send me an e-mail! I have some pictures and schematics, as well as some copies from a couple of catalouges from the distributor out here: MILES PLATTING. Sorry it's only a folder with data files so far. Other vintage, British amps I have or had, is two Selmer Treble N' Bass 50, one MKII and one MKIII (both sold now), several Carlsbro 50 Top and a Carlsbro 100 Twin Channel. I also have some Italian FBT tube amps, 150, 250 and 500-R2, as well as a few Swedish Hagström tube amps, 210, 310, 510, 620 and 840. Not all of them are restored yet. See early inputs below the image! Please send me an e-mail (remove NOSPAM) if you have any additional information, comments, corrections or questions about IMPACT! If you happen to have a 60 Reverb amp for sale, please let me know! If that's not where you came from, please make a visit at Plexi Palace, where there sometimes is some talk about Impact amps under the cathegory "Miscellaneous British Amplifiers". My own user name there is "6 10"
Click on the grey corner for a larger image. Click on the pictures or the links for more about the products! So far I've got some about the 60W head, (updated) the 100W head (updated) and the 4x12" speaker cab. IMPACT 60 Amps, cabs and schematics. 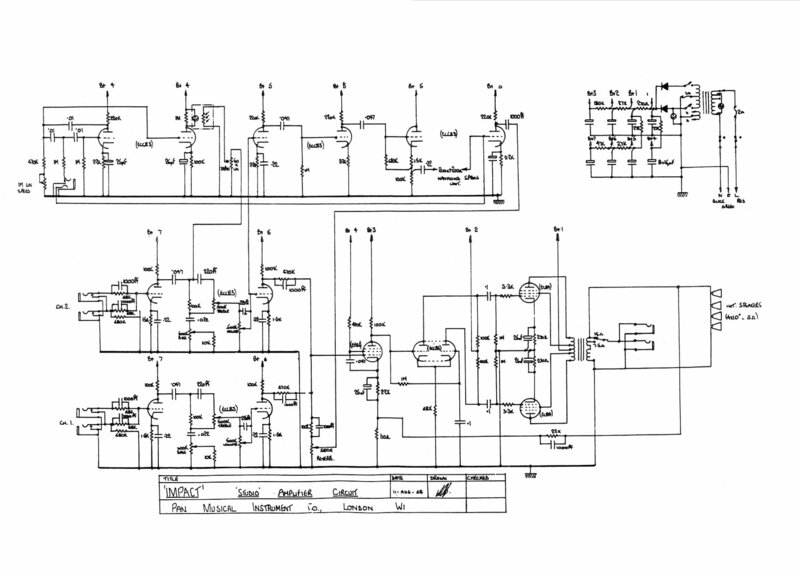 IMPACT 100 Amp and schematics. Rob: Dallas-arbiter made stuff for Jimmy Page '64-65ish followed by the fuzzface for Hendrix etc. Then made Sound City amps. That's about what I know. Om Du förstår Svenska, så titta gärna på resten av min hemsida! Jag säljer bl.a. Hammond transformatorer och chassin, rör, m.m. Jag utför även service, renoveringar och ombyggnader av rörförstärkare. Sixten Forsén, EDGAR Audio, Bollnäs Sweden.